Book Update: An update on what I learned from “Salt, Sugar, Fat”: The department of Agriculture receives a $146 billion budget. Yes, billion. The nutrition center for our Dept. of Agriculture receives .0046% of the budget. Ouch. I learned Lunchables were invented to save slumping bologna sales. Kool-Aid Koolbursts were invented to get kids to like kool-aid again due to their previous slumping sales as well. They state they have “real fruit juice” in them which accounts for less than 1/2 tablespoon of fruit juice per bottle. Here is the list of the recipes! There are 9 of them and the downloads are here and at the bottom of the post. Print the Inventory on sticker paper and you can use it for making labels, too! Every 3 months or less, our local grocery store has boneless, skinless chicken breast for sale for $1.79 or $1.99 per pound. No where in St. Louis can I find a less expensive price. Well, at least not 1 and 1/2 miles down the road. Instead of developing another workshop around a variety of meats that can be purchased at normal price, I created my own chicken workshop based solely on the chicken breast on sale. You could also do this with bone-in chicken breast which goes on sale for 99 cents/lb. once in a while as well. Therefore, I bought 5 packages of chicken that weighed 3-4 pounds each. It takes about 2 lbs. to equal 4 chicken breast which equals one meal for our family of 4 (plus leftovers for lunches because the kids won’t eat an entire chicken breast on their own). This gives me 9 meals of chicken. If we eat a chicken meal once a week, I will be through my 9 meals in 3 months and the chicken will be on sale again to make more meals. 1. I have noticed that Ziplock does a better freezer job than the generic brands. This round of freezing was not great and the reason is my use of the cheaper generic bags. I am going to go back to Ziplock because they leak a lot less. The extra 5 cents will be worth it in the long run to not have to throw away a $10 dinner. 2. 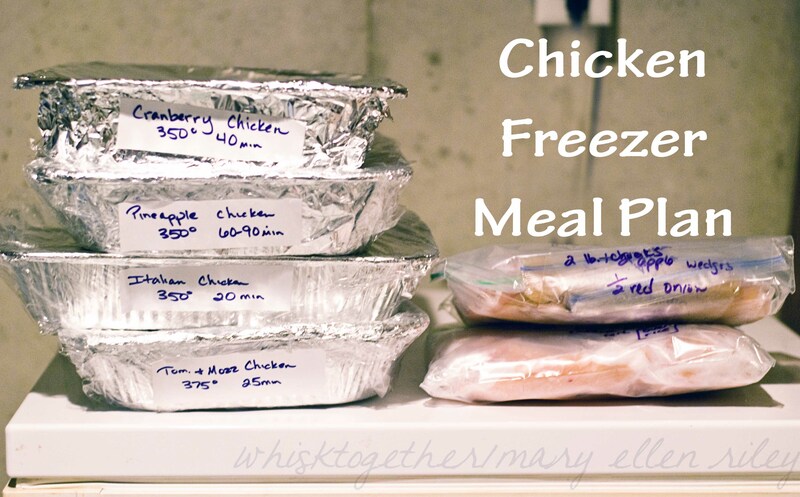 When stacking your foil pans in the freezer, do not stack them like normal up and down. Instead, stack them staggered. Have the bottom going longways and the one going on top turned 90 degrees like in the photo. This will keep the food from falling into the other pan before it has the time to freezer all of the way through. 3. Add salt and pepper at your discretion. I like to keep the ingredients low-sodium until the very end in order to add salt as I see fit. I normally use low sodium broths and low sodium soy sauce. 4. If I list “chicken breast”, then just assume it is skinless and boneless. Although many of these recipes – unless the chicken is chopped – could be used with either boneless or bone-in. 5. This took 2 hours to assemble and an extra 30 minutes to cut my own meat. I should have had the butcher do it – try to have your butcher do it! Saves a lot of trouble and washing cutting boards at home, too. 6. 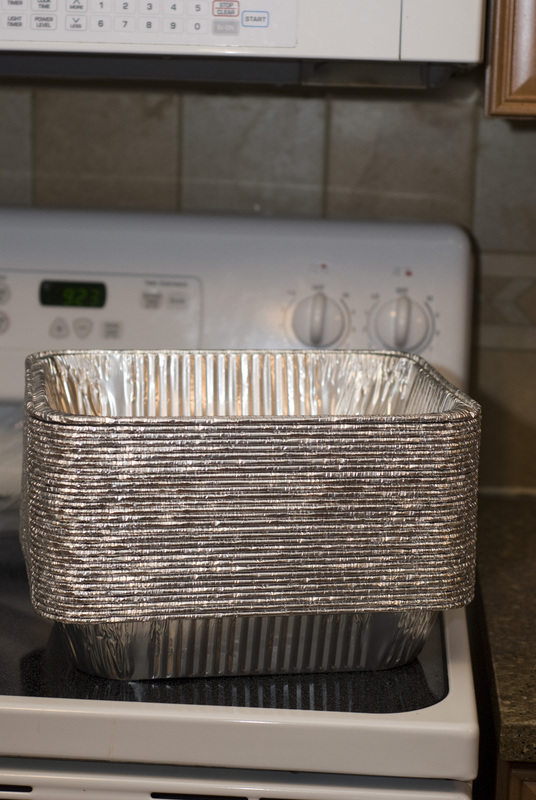 Foil Pans: I love to use foil pans. Yes, it costs a little more. Costco sells these aluminum pans for $5 for 30 of them. Uh huh. 30 of them. I know – you go to Walmart and they cost $1-2 each! 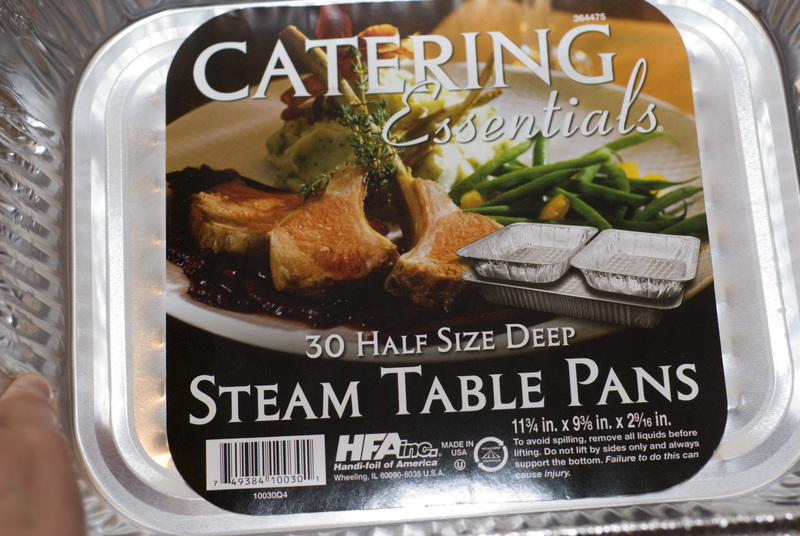 Amazon and restaurant supply stores also carry foil pans in bulk. When using Foil pans: I always spray them with cooking spray first before I add anything to them. Sometimes, if there is a lot of space between the foil and the food (which is common with chicken tenders, cut up chicken, etc. ), then I will press a piece of foil onto the food to eliminate air contact. Then, I add a second piece of foil on top to cover the entire pan. And third, you can wrap in plastic wrap if you want or not. If I know it will be a few weeks before we make the meal, I will wrap it in plastic wrap over the foil. 6. I am a Wildtree representative and love many of their products. 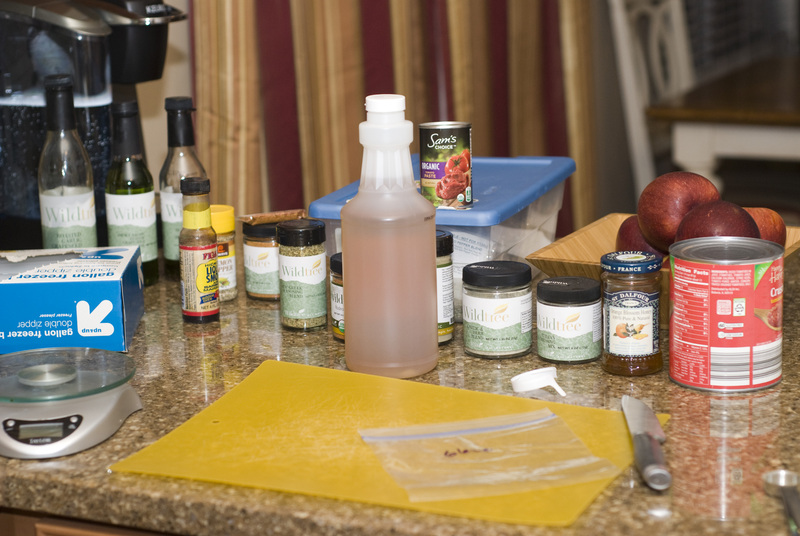 They help eliminate a lot of ingredients because their fajita seasoning is all in one jar. Or, their garlic and herb blend is all in one jar. You can purchase these products, or find something similar at your grocery store, or make your own. I listed the ingredients that would be found if you had the product yourself. I know I can make my own fajita seasoning, but sometimes it is just easier to have one jar instead of 5 when making meals. Here is the inventory I put on my door because otherwise I will forget what is in my freezer. Thank you for the new menu! hi, i do not see the 9 posts for the chicken recipes. you stated they are at the bottom of this page? thanks, i really am enjoying your site. They are linked in the Recipe update after the list of recipes and also at the bottom of the page under “Step One” and “Step Two”. Hope that helps! Thanks. i was interested in the chicken fajita soup, can’t wait to try it. It is similar to chicken tortilla soup, but I liked the method. For some reason, I found it incredibly spicy even when I omitted the green chilis. I asked my Wildtree rep and she said that she didn’t think so and had heard rave reviews. So, make sure to try it before adding it to your soup, or follow my alternative directions if you do not own the Wildtree Fajita seasoning. We just made the Tuscan Chicken Luau. I added soy sauce to my plate of it – Delicious!